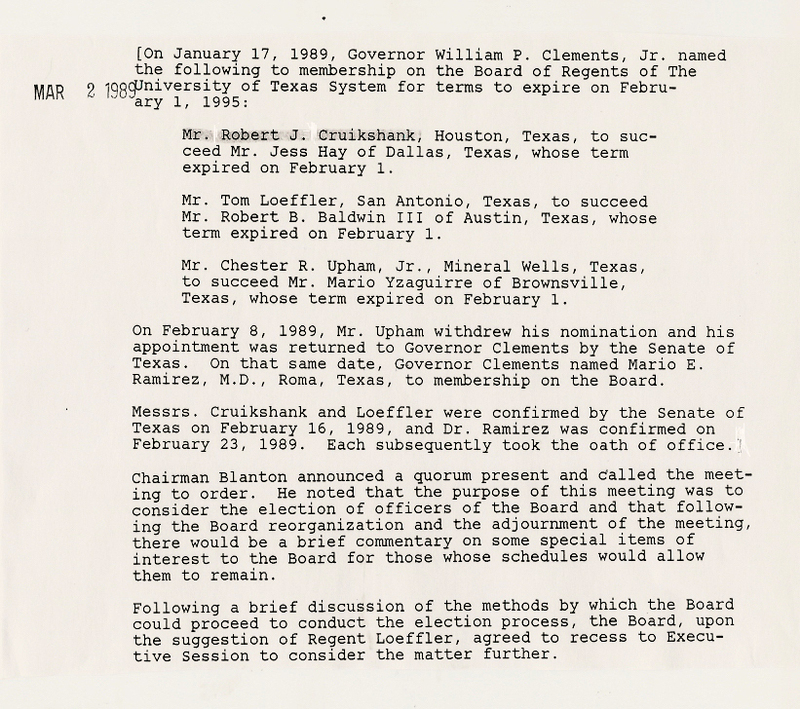 ROBERT J. CRUIKSHANK of Houston was appointed to a six-year term on the Board of Regents of The University of Texas System by Governor William P. Clements in February 1989. He was elected Vice-Chairman of the Board in March 1991. Mr. Cruikshank joined the international public accounting firm of Deloitte Haskins & Sells when it merged in 1963 with the prominent Houston firm Phillips, Sheffield, Hopson, Lewis & Luther, with which he was associated. He became a Partner in Deloitte Haskins & Sells in 1968 and Partner-in-Charge of the firm's Houston office in 1974. He has served on the Board of Directors of Deloitte Haskins & Sells since 1982. Mr. Cruikshank was born in Lake Charles, Louisiana, on September 12, 1930, the son of Mrs. Salmon Wright and the late Louis James Cruikshank. He graduated in 1951 from Rice University with a Bachelor of Arts Degree and then served four years as an officer in the United States Air Force. He also completed the Advanced Management Program at Harvard University in 1982. Since qualifying as a Certified Public Accountant in 1959, he has served on many professional committees, as an officer of the Houston Chapter of the Texas Society of CPAs, and as a member of the AICPA, the national organization of accounting professionals. Mr. Cruikshank has also been a visiting lecturer in accounting at Rice University. He currently serves as a member and/or office of the governing boards of a number of community and civic organizations including the Texas Children's Hospital, the Institute of Religion, the Fish Foundation, the Museum of Science, the M.D. Anderson Board of Visitors, Advisory Councils associated with The University of Texas at Austin and Rice University, Greater Houston Partnership and others related to the cultural and fine arts programs in the Houston area. Mr. Cruikshank also served Governor Clements as Chairman of the Governor's Task Force on Accounting, Auditing and Financial Reporting for the State of Texas and Mayor Whitmire of Houston as Co-Chairman of the Mayor's Task Force on Drug Abuse. He has been especially active in the Houston, Texas and American Heart Associations and has received the highest award for distinguished service from each of these organizations. Recognizing his professional accomplishments, the Texas Society of Certified Public Accountants awarded him its Distinguished Public Service Award. Mr. Cruikshank has also been the Senior Warden and Treasurer of St. John the Divine Episcopal Church; Director and Treasurer of the Houston American Revolution Bicentennial Commission; and President and Director of the Post Oak YMCA Family Center. Mr. Cruikshank is married to the former Patty Hansen and has two children.